With all of the necessary tools and equipment on hand, it’s time to begin complete engine disassembly. Though it might seem relatively easy, it’s a methodical process that should be considered as important as any other portion of the rebuild, and shouldn’t be performed haphazardly. It not only gives you a firsthand look at how engine components interact during typical operation and the slight tolerances between them, it also reveals just how well your engine is functioning overall. 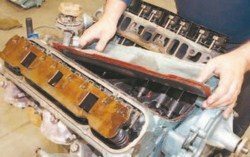 Using your engine’s operating characteristics just prior to the decision to rebuild as a guideline, you might consider more closely inspecting suspect components or those potentially related to the issue for a possible cause during disassembly. For instance, if oil consumption is an issue, check for worn valveguides or irregular piston and/or ring wear. 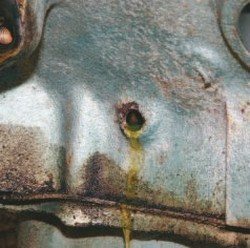 If the engine uses coolant, check the head gaskets for signs of seepage. 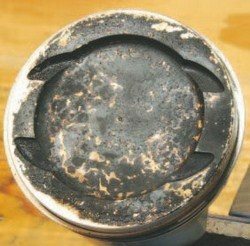 And if your engine routinely detonates under moderate load, check the piston crowns and combustion chambers for excessive carbon buildup. This engine’s external appearance doesn’t lend any clue to its internal operating condition. It wasn’t until complete disassembly that I gained a better understanding of why it ran so poorly. A countless number of detailed photo-graphs were taken before and during tear down. Such photos can be a great asset when determining where components go during reassembly. Disassembly also gives the opportunity to gauge the level of care an engine received from its previous owners. Sludge or deposits in areas where oil typically puddles might indicate a lack of regular oil change intervals. 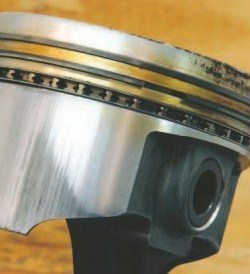 Scored cylinder walls or scuffed piston skirts could indicate tight tolerances or careless high-speed operation. 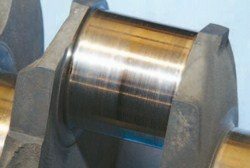 Worn main and rod bearings could indicate an oil-distribution or pressure-related issue, or possibly improper machining. The list goes on. 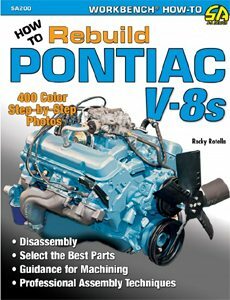 For this book, the owner prepared his GTO for engine removal at home by working a few hours each night for several days. Detailed pictures of the entire engine compartment were taken from every imaginable angle to use as a visual aid during reassembly. The hood was unbolted, the coolant and oil was drained, and the radiator was removed. The accessories were unbolted and moved aside, the carburetor and exhaust manifolds were removed, and the engine wiring harness was disconnected and masking tape and a permanent marker were used to note each wire’s exact location. 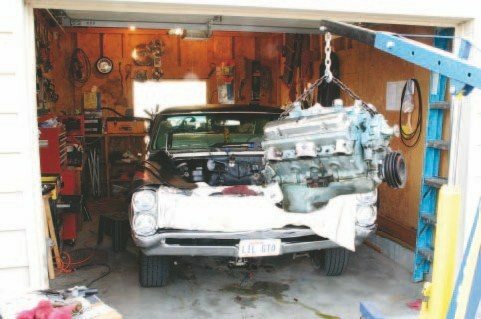 After deciding to completely rebuild this GTO’s 400, the owner and a helper pulled the engine in the comfort of his home garage. Anything bolted to the engine that could be easily damaged or impede extraction was removed and set aside. Engine removal is different for each vehicle. 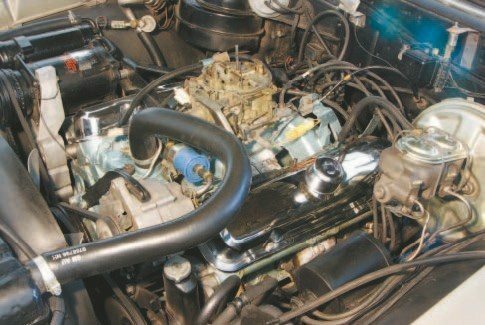 It typically includes draining the coolant and oil, and removing the carburetor, fuel lines, wiring, vacuum hoses, distributor cap and coil, accessory brackets and pulleys, and radiator. Some prefer to remove the transmission with the engine, but that can add several more steps and could make separating the engine and transmission more difficult while it is suspended. I recommend unbolting the transmission bell-housing from the engine, and the torque converter from the flexplate if equipped with an automatic transmission, and leaving the transmission in the car. 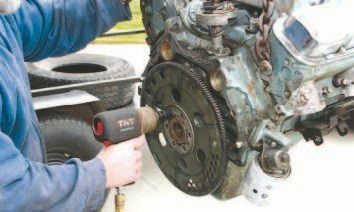 Remove the clutch countershaft from the engine or frame rail on cars equipped with a manual transmission. Unbolt the exhaust manifolds from the engine or the head pipes, whichever is easier. Then, remove the engine mount bolts. 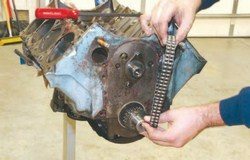 Connect a section of heavy tow chain to the cylinder heads, or a carburetor flange adapter to a “cherry-picker” hoist. Lift the engine up and away while the helper watches closely for anything that might snag the engine during lift-out. Before disassembly begins, remove the flexplate from the engine while it is suspended from the hoist. This prevents damaging it or the ring gear while bolting it to an engine stand. It can be difficult to apply sufficient torque to remove the bolts while the engine is hanging loose. If you have a helper who can prevent the engine from rotating by using a flywheel-holding tool, you can use a long 1/2-inch breaker and 5/8-inch socket. However, I prefer using a 1/2-inch-drive pneumatic impact wrench as opposed to hand tools for this task. Note the orientation of the flexplate in relation to the engine and place the bolts and star washer in a clearly marked bag. If the engine is equipped with flywheel and clutch assembly, remove the pressure plate first. Watch that the clutch disk doesn’t fall onto your feet as the pressure plate is pulled away! Remove the flywheel in a manner similar to removing a flexplate. Inspect the ring gear for signs of excessively worn or missing teeth. If a flywheel, inspect the clutch contact surface closely for heat cracks. While some can be removed with milling, it’s sometimes easier to start with a new flywheel. While suspended from the cherrypicker hoist, mount the engine from its bell-housing flange to a highquality engine stand with Grade-8 hardware. To prevent it from falling over and causing significant damage to itself or anyone standing nearby, have a helper gently lower the hoist while you watch that the engine sets down easily on solid pavement. Units similar to this retail for less than $100, while used stands in good condition can be found for about half that at local swap meets or Internet classifieds. A complete Pontiac engine typically weighs around 700 pounds, so you’re safest using an engine stand with a capacity rating of at least 1,000 pounds. The transmission was supported from beneath by a hydraulic jack, and the torque converter, transmission bellhousing, and motor mount bolts were removed. Using a highquality engine hoist and a length of heavy chain, the engine was lifted up and out of the vehicle while closely watching for any snagged electrical wires, additional pieces that needed to be removed, and sufficient clearance in every direction. 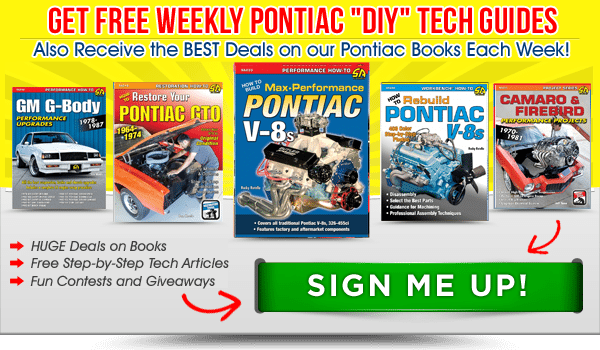 You can expect to perform a similar process if you’re pulling your Pontiac’s engine. Since this 400 operated normally and didn’t experience catastrophic failure, I didn’t treat its disassembly different from any other. Once the engine was secured to a suitable engine stand, I worked toward the center of it. My first goal was to remove the cylinder heads, which tends to make the engine more balanced, more maneuverable, and much easier to rotate on the stand. I then focused on removing the oil pan, camshaft, and rotating assembly in that order. Though each example in the Pontiac V-8 engine family shares common characteristics, it seems each variant contains something that’s slightly different. For instance, early engines utilized a reverse-flow coolant system, and the rocker system of engines through the mid 1960s was oiled through its studs. This particular 400 contains neither, and as such, the disassembly steps shown do not touch on them. If your particular engine has one or more characteristics not covered here, I recommend that you consult a factory service manual for that portion. As the components were removed from the engine, I closely inspected each for signs of abnormal wear and photographed and noted anything that looked suspect. Each component was stored in a safe and dry location and placed in close proximity to others as it was removed to prevent losing anything. I stored small parts and hardware in clearly marked Ziploc-type bags, photographed each bag, and placed them in a dedicated box or container that remained with major components throughout the process. I found several issues that I considered areas of great concern during component inspection, and each instance was noted for the machinist. 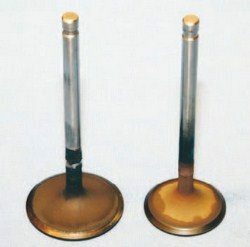 The pistons and combustion chambers were heavily coated with carbon, indicating that the engine was not burning cleanly. At least one of the lifters was irregularly worn, and the camshaft was difficult to remove from the block. The piston skirts had some visible scuffing, and some of the connecting rod bearings were worn to the copper. The owner and I discussed what was found in his engine and agreed that the decision to rebuild was very timely. It seems that significant damage or complete failure could have occurred at any time without much warning or indication, and that certainly would have cost him even more time, money, and aggravation. The next step was to choose a machinist whose ability was one that we were equally comfortable with to correctly rebuild this 400 and determine exactly what it needs. 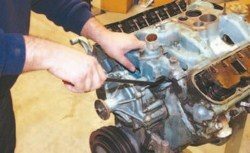 An engine is much more balanced and easier to maneuver when its cylinder heads are removed. 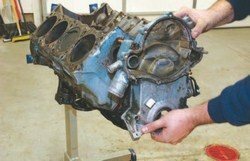 That process first involves disassembling the engine’s top end components. Though the fluids were drained before removing the engine from the vehicle, a certain amount inevitably remains in its internal passageways. Just before beginning disassembly, remove the oil filter (if still installed) and the oil filter housing bolts (using a 9/16- inch wrench), and drain the remaining coolant from the water jacket surrounding each cylinder bank by removing the drain plug on both sides. The type of wrench required to remove the drain plugs varies. Drain the oil pan in a similar manner with an 11/16-inch wrench. 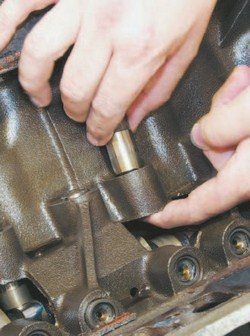 Remove the valve cover bolts with a 7/16-inch socket. Lift off the valve covers. Place units with a chromeplated finish into a cloth or in a safe location where they cannot be scratched or damaged. Place the bolts and wire-harness retainers into a clearly marked bag. Pontiac intake manifolds are sealed to the timing cover and use a rubber O-ring and a long bolt. The intake is used as a bypass to circulate coolant throughout the engine while the thermostat is closed during warm-up. Remove the bypass bolt with a long 7/16-inch box-end wrench for maximum leverage. Rust and corrosion can make the bolt difficult to remove. To avoid possibly breaking it, exercise patience during the process. Remove the 10 bolts that secure the intake manifold to the cylinder heads with a 9/16-inch wrench and place them in a clearly marked bag. Many later engines use studded bolts on either side of the water crossover, which serve to secure various accessory brackets. This 400 didn’t use any. Use a pry bar to separate the intake manifold from the cylinder heads. Lift the intake manifold up and away from the engine. A typical cast-iron Pontiac intake manifold weighs at least 40 pounds, so be sure to have a firm grip on it during removal. Remove the two bolts that secure the valley pan to the block with a 9/16- inch socket, and then walk a pry bar around the perimeter of the valley pan. Gentle pressure may be required to break the silicone seal bond. Use care to prevent bending the pan’s thin lip because that could impede its ability to seal if it is reused during reassembly. Remove the distributor cap and external coil of a points-type system before removing the engine from the car. Remove the single bolt securing the distributor hold-down with a 9/16-inch socket. The bolt and hold down are placed in a clearly marked bag. Lift the distributor up and out of the block. Rotate the distributor housing while lifting it; this can make removal a bit easier. 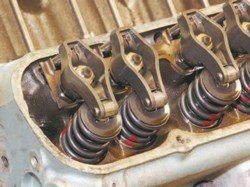 Most production Pontiac V-8s produced through the early 1970s used a bolt-on oil dripper to lubricate the rocker arms, while a version that was welded on to the valve covers was used later. The bolt-on type is fastened to the studded head bolts and is commonly discarded or forgotten during rebuilds that lack attention to small details. Remove the retaining nuts with a 9/16-inch socket. Pontiac developed the stamped steel rocker arm assembly for the new V-8 it introduced in 1955. Comp Cams produced these roller-tip rocker arms, which were a popular upgrade during the 1990s. The roller tip is intended to reduce the side loading that causes valveguide wear. The roller tip rocker otherwise installs and functions just like an original. Remove the nut securing the rocker arm pivot ball with a 5/8-inch socket. 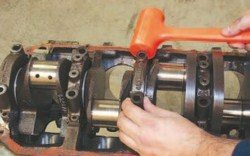 Inspect the contact surfaces of each rocker arm and pivot ball for pitting or galling. Because the rocker arm and pivot ball wear-in together and self-adjust to each other, it’s best to keep each pair united. Like all pieces of the valvetrain, I prefer to keep the rocker arm assemblies in sequential order for inspection purposes. A valvetrain organizer, like this from Comp Cams, is an excellent way to maintain the order of the valvetrain components for each cylinder during disassembly. It allows for complete inspection of each complementing component after the entire valvetrain has been removed. The high-quality plastic tray is impervious to oil and solvents and cleans up easily. Remove the pushrods and organize them in sequential order. Then remove and organize the lifters in a similar fashion. Two hands are required for removal, so use one to push the lifter upward and the other to lift it from the bore. 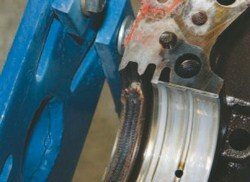 Quickly inspect each lifter face for immediate signs of abnormal wear such as grooving, pitting, or cracking. Organize them in a manner so each lifter can be inspected closer along with its corresponding lobe when the camshaft is removed. The 10 bolts securing the cylinder heads were likely torqued in a specific pattern during assembly. It generally includes working in a spiral pattern outward from the center bolt. A spiral pattern is not necessary for bolt removal during disassembly. I tend to pick an outside bolt, loosening each as I work toward the center in a spiral pattern. The head bolts are very tight. 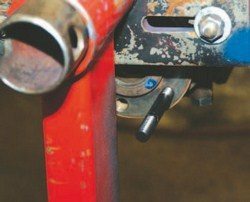 I use a long, 1/2-inch-drive breaker bar for maximum leverage and I squarely seat a quality 3/4-inch socket against the cylinder head to prevent rounding the edges. Some bolts on this 400 required noticeably less effort to remove than others, which possibly indicates improper torque during installation or a head gasket that didn’t crush evenly. I recommend loosely reinstalling one or two head bolts. It keeps the cylinder head from falling off the block during the next step. Dowel pins locate the cylinder heads on the block. In most cases, you need to use a forceful upward tug to break the cylinder head free from any sealing compounds or corrosion. 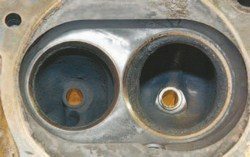 Place a pry bar into an intake port and smoothly apply pressure until the cylinder head pops up against the two remaining head bolts. If the cylinder head does not move after a fair amount of prying force has been applied, stop prying! Closely inspect for any hidden head bolts that may still be installed. 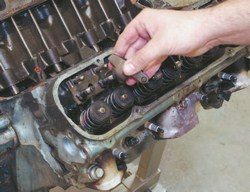 Once the cylinder head is loose, remove the remaining head bolts, inventory them all, and lift the head up and away from the engine. 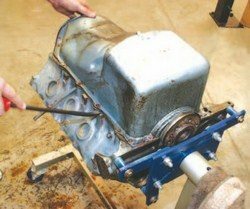 I prefer grabbing the loose cylinder head near its exhaust ports and lifting it toward the center of the block, where I can carefully slide my fingers beneath it and grasp it firmly. Fully assembled iron cylinder heads weight nearly 60 pounds each, so be prepared to lift it off the engine block. It can inflict damage and serious pain if dropped on your feet. Visually inspect the pistons and cylinder walls to gain an insight into the engine’s overall operating condition. The dish found on these pistons reveals that the engine’s static compression ratio was much lower than its original rating of 10.25:1. The heavy deposits indicate that oil was entering the combustion chamber and that irregular combustion was occurring. The cylinder walls have a defined ridge at the top but otherwise look fine. Closely inspect the block deck and head gaskets for any signs of coolant and cylinder pressure seepage. If seepage is identified, there could be an underlying issue. 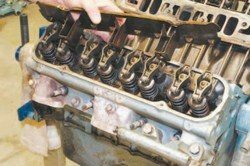 If the head gaskets are in good condition, they can be reused if you’re on an extremely tight budget, but I strongly recommend using new, high-quality gaskets because a well-sealed head is essential. In this case, the coolant found leaking outward around this cylinder head bolt has clearly ruined this gasket. The leak was likely the result of an under-torqued head bolt, and we found several during cylinder head removal. Soot trails found between cylinders are further indication that the head bolts were not properly torqued. Unbolt the water and fuel pumps, and remove the lower pulley from the harmonic balancer with 1/2- and 9/16-inch sockets. Inventory and set aside the hardware and accessories. You now have clear access to the harmonic balancer bolt, which should be extremely tight. I prefer a pneumatic impact wrench if compressed air is available. 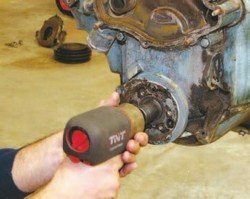 A very long 1/2-inch-drive breaker bar and a 15/16-inch socket can be used to remove the bolt, but crankshaft rotation must be prevented. Thread a long, hardened steel 1/2-inch x 20 stud into a flywheel bolt hole on the flywheel register. The stud then locks the crankshaft when it contacts the engine stand, so the balancer bolt can be removed. On a Pontiac V-8, the harmonic balancer is used to dampen harmonic vibrations, and not necessarily balance the front end of the crankshaft, as its name suggests. Pontiac actually corrected its name in later years, referring to it as a “harmonic damper” in factory literature. It is designed to be an integral part of the crankshaft, is located on the front snout by a large keyway, and is secured to the crankshaft by a bolt torqued to 160 ft-lbs. 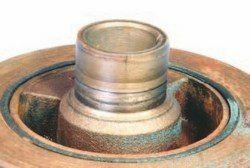 A common cause of harmonic balancer failure is improper bolt torque. That allows the balancer to shimmy on the keyway, which causes it to crack. If not caught quickly, it can cause the balancer to separate at speed and cause complete crankshaft failure. The harmonic balancer should be replaced if there is any sign of fatigue. 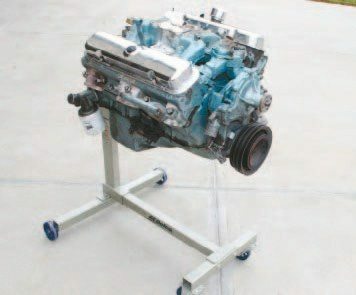 After the cylinder heads have been removed, an engine is much easier to rotate on an engine stand. 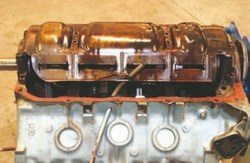 Rotate the engine 180 degrees and remove the 18 bolts that secure the oil pan to the block and timing cover with a 7/16-inch socket. The oil pan should lift up and away, but it is usually bonded to the block with RTV sealer. Position a pry-bar between the oil pan lip and the block rail. Apply gentle pressure and walk the pry bar around the pan until the oil pan is free. Rotate the engine 180 degrees, returning it to right side up. 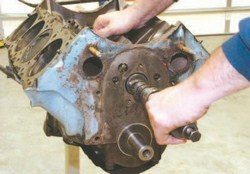 Remove the two bolts and two nuts that secure the timing cover to the block with a 9/16-inch socket and inventory the parts. RTV sealer is often used to prevent leaks during rebuilds, and it was clearly used in this instance. Persuasion with a rubber mallet and pry bar is sometimes required to break the sealant’s bond on the timing cover. Remove the fuel-pump eccentric retaining bolt with a 3/4-inch socket, and then set it aside for later use. Walk the cam gear off of the camshaft snout with a pry-bar. The crankshaft gear should slide off but could also require some gentle prying. 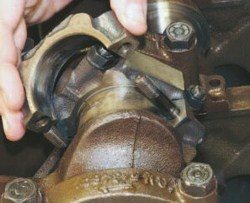 Inspect the entire timing set for signs of abnormal wear such as excessive chain stretch or worn gear teeth. None were found here. Remove the camshaft thrust plate with a 1/2-inch socket. Inventory the bolts and inspect the thrust plate for abnormal wear. If you don’t have a camshaft installation tool available, thread the fuel pump eccentric bolt back into the camshaft snout. It serves as something to grasp while pulling the camshaft outward from the engine. Position the camshaft far enough out so that it can be firmly grabbed with one hand. The rear journal can be supported with the other hand, and the cam guided through the bearings. Some of the valuable anti-wear additives have been removed from modern-spec oil, and it can negatively affect flat-tappet camshaft life. Even though this camshaft showed no signs of lobe failure, the lifters tell a different story. 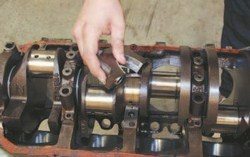 A flat-tappet camshaft lobe is designed to rotate its lifter during normal operation, and the lifter face should gain a distinct polishing pattern immediately after the break-in process. The unit on the left is an excellent example of ideal lifter condition after long periods of normal operation. The lifter on the right never rotated and complete failure was in the very near future. It’s possible that this resulted from incorrect camshaft lobe finishing, improper camshaft break-in, or tight lifter-to-bore tolerances. It’s something that must be noted and communicated to the machinist. Pontiac used at least three different oil pumps for its V-8 engines, and they’re typically categorized by approximate pressure ratings. The oil pump is secured to the block by two bolts and is driven by an intermediate shaft captured between the distributor and oil pump. 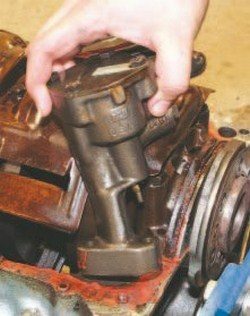 There is a loop cast into the block and two tabs are pinched near the top of the driveshaft, so the driveshaft does not disengage from the oil pump tang during distributor removal. 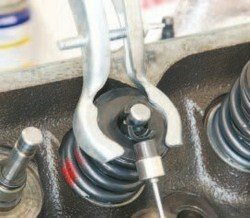 Remove the oil pump bolts with a 9/16-inch socket, and the driveshaft simply lifts up and out once the oil pump is removed. Many Pontiac V-8s were equipped with an oil pan baffle secured to the number-2 and -4 main caps. Also referred to as a “windage tray,” it combats oil aeration during high-speed operation and also captures the lower oil dipstick tube. Remove the windage tray retaining bolts with a 1/2-inch socket and then inventory them. After it has been removed, then lift and remove the tray. Inventory the lower dipstick tube parts and other small parts. Address each connecting rod separately. 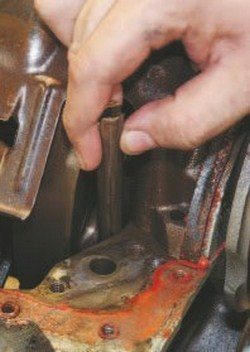 Use a long, 1/2-inch-drive breaker bar and a 9/16-inch socket to loosen the nuts by several threads. The nuts are not totally removed at this time, however. They are used to keep the rod and cap together while separating the two. It may take several gentle smacks from a soft-face hammer on the side of the connecting rod to separate them. Another method is to tap downward on the nuts, which drives the connecting rod away from the cap. After the cap is loose, the nuts are completely removed and the cap and bearing are removed, inventoried, and set aside. 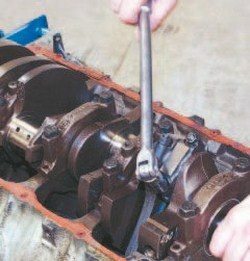 Because the connecting rod and cap is a matched pair, however, the two are quickly reunited and the nuts loosely reinstalled after removing the piston-and-rod assembly from the block. 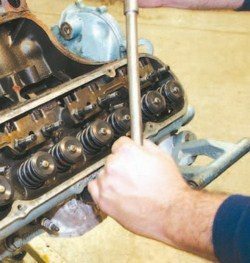 Position a long wooden handle under the piston crown and drive the piston toward the top of the cylinder bore and into an awaiting hand. Use caution when catching the pistonand-rod assembly! 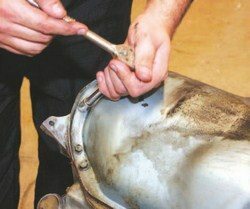 It can be difficult to hold because the connecting rod swings free under its own weight after being pulled from the bore. A helper may be required if an excessive buildup has created a ridge at the top of the cylinders. The ridge can cause the pistons to bind up in the bore during removal. If the pistons cannot be easily removed, use a specialty tool, called a “ridge reamer,” to remove the ridge close to the deck. This should allow the pistons to pass through the bores. 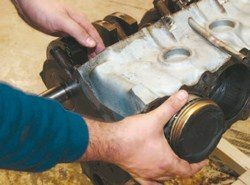 If your rebuild includes new pistons, you can also use a hammer to tap on the wooden handle, forcing the piston outward and into a helper’s hands. 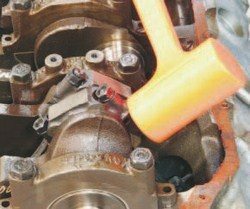 Immediately reunite the connecting rod cap with the connecting rod. 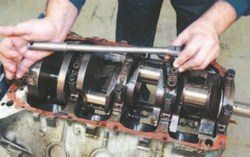 The condition of an engine’s bearings usually tells of its general operating condition. These rod bearings are something no owner wants to find. 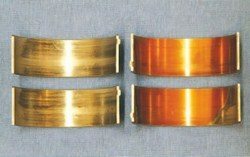 The lower rod bearings (left) show above-average wear while the upper rod bearings (right) are clearly worn to the copper. Engines with this wear pattern have typically experienced significant detonation. 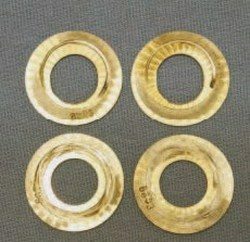 Each of the eight upper and lower bearings showed the same level of wear. It’s very possible that this 400 was on the verge of significant failure. The pistons appear to be forged-aluminum Sealed Power replacements with a dish cut into the crown to reduce compression. The amount of carbon built up in and around the dish further indicates that some type of irregular combustion had occurred. 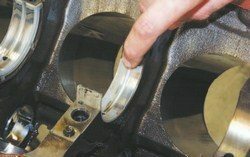 The scuffing on the piston skirts appears to be mostly cosmetic and may have possibly occurred when the coolant temperature was too high to maintain sufficient skirt lubrication. Large bolts retain and dowel pins locate the main caps of a Pontiac V-8. The main cap bolts are very tight, and the bolts of the first four caps are removed with a long, 1/2-inch-drive breaker bar and 3/4-inch socket, while the last main cap bolts are removed with a 15/16-inch socket. Remove the main cap bolts and place them into a clearly marked bag. The tight fit of the dowel can make main cap removal impossible without a bit of persuasion. The main cap is alternately tapped on its sides with a soft-face hammer to walk it off the dowel pins while carefully pulling the cap upward. Once free, the cap and bearing are set aside for inspection. Pontiac cast sequential numbers into the first four main caps for identification purposes, so there wasn’t a need to label them like we did the connecting rods. The number-5 main cap is visually different than the others and does not interchange, so there’s no way of confusing its identity with any other. With the main caps removed, firmly grasp the crankshaft by its front snout and flywheel register, and lift it up and out of the block. Set it aside for inspection. The crankshaft is extremely heavy and quite slick; handle it with extreme care. Dropping it on the ground could inflict irreparable damage to it or you! The owner complained of a significant oil leak coming from the rear of the engine, and this explains why. This replacement rope-type rear main seal spun shortly after the last rebuild was completed because it had likely been improperly installed. Thus it was either not packed into the groove correctly or not lubricated sufficiently for initial start-up. As a result, its functional ability had been severely compromised. The seal was partially pried out of the block and rear main cap using a screwdriver so it could be removed by hand. After the crankshaft has been removed, it’s common to find the upper main bearings still in the block main saddles. To remove the main bearings, push on the end opposite of the bearing tang, and rotate each by hand until there is enough of it exposed to grab it and lift it out. You can also use a flat-head screwdriver to persuade stubborn bearings. The main bearings of this 400 showed no real wear, which indicates ideal tolerances between the crankshaft and block. Consistent copper could reveal an oil supply issue, while scoring may indicate that some type of debris had once circulated throughout the oiling system. 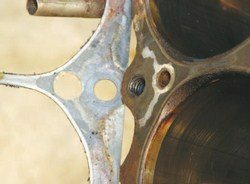 The main bearings show no signs of any pending issue, and the crankshaft main journals appear to be in excellent condition. Though the upper rod bearings showed significant wear, we didn’t find any sign of complete bearing failure, so we didn’t expect there to be any significant crankshaft rod journal damage. The machinist inspects for deep scores or scratches and measures for journal irregularities to determine if any journal grinding is required. 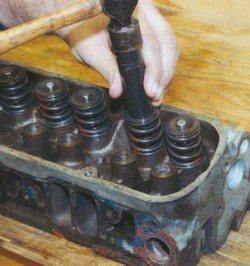 With a cylinder head on the workbench, remove the threaded rocker studs with an 11/16-inch socket. Inventory and set aside the studs and guide plates. Place a large socket onto the retainer and each valvespring, and give it a forceful jolt with a hammer to loosen the retainer and locks. This should make valvespring removal easier. This cylinder head has been fastened to a homemade cylinder-head stand for convenience, but one isn’t required for cylinder head disassembly. Use a high-quality valvespring compressor to compress a valvespring, and use a magnet to remove the locks. Once decompressed, the retainer, valvespring, and any seat shim beneath is lifted away. Inspect the entire assembly for abnormal wear. Pontiac originally used a dual valvespring package (left) on its V-8 engines. 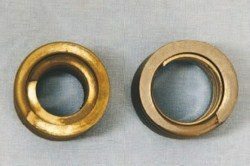 The single-spring pac kage found on this 400 (right) was a popular stock replacement that Crane Cams sold in the 1990s. Inspect the valveguide area and the condition of spring shims. In this case, nothing kept Crane’s singlespring replacement from dancing about the guide. And the pronounced wear found on several of this 400’s spring shims clearly indicates significant valvetrain instability. 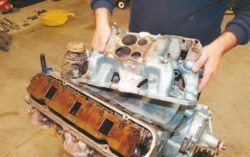 It corroborates the owner’s report of a valve float condition at high RPM and is likely the cause of a number of hobbyist reports of broken coils over the years. Dual springs are an excellent option with a rebuild. In addition to better pressure control, dual springs maintain the spring’s position around the guide. 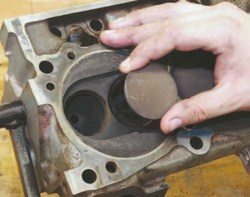 While removing the valves from a cylinder head, pull each valve out slightly and shift in every direction to assess the condition of its valveguide. If there’s more than a slight amount of freeplay, it’s likely that the valveguide is excessively worn and needs to be replaced. Your machinist uses a valveguide dial bore gauge to accurately measure the valveguide and determine if that action is required, however. The valve should pull straight out. 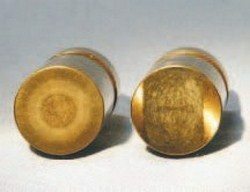 If the valve stem tip presents any resistance as you attempt to pull the valve through the guide, a small file may be required to gently remove the ridge in the valve lock groove that’s sometimes formed by the valve locks over time. A visual inspection of the combustion chamber and valve seats is performed after the cylinder head is completely disassembled. Inspect for burn pattern consistency within the combustion chambers and for irregular valve seat wear or pitting. 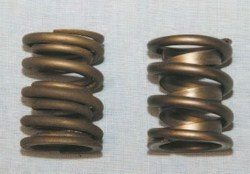 If seat wear isn’t concentric, it might indicate excessive spring pressure, unhardened valve seats, a machining error during the last valve job, or even a bent valve. Nothing of any immediate concern was found on these cylinder heads. 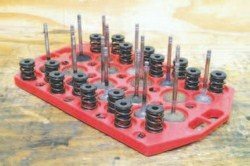 A cylinder head organizing tray like this from Comp Cams makes cylinder head disassembly much easier. It includes cups for practically everything that’s removed, and the components can be positioned to maintain consistent order for disassembly and inspection purposes. 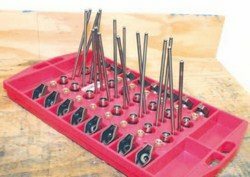 It is a worthwhile investment that can help keep your workbench organized.